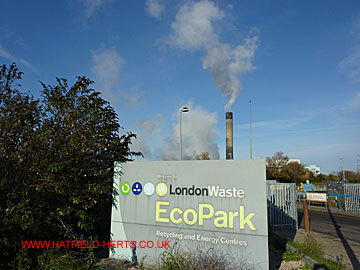 The Edmonton Incinerator, officially the LondonWaste EcoPark, is one of the largest incinerators in the UK. 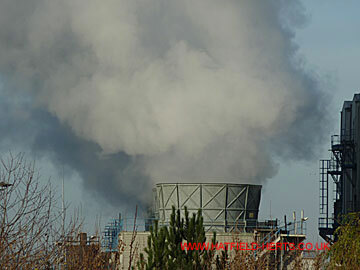 Situated in North London (N18 3AG) the pictures give an idea of the size of an Energy from Waste (EfW) facility – but not of the terrible smell (the facility also includes a composting section so it was not possible to tell if there is a smell from the chimney emissions). 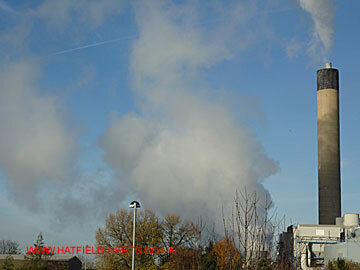 Taken on a very cold day (Sunday, 28 November 2010) the emissions of smoke and steam are more visible than in warm weather but they give an indication of how much matter is being constantly pumped out. 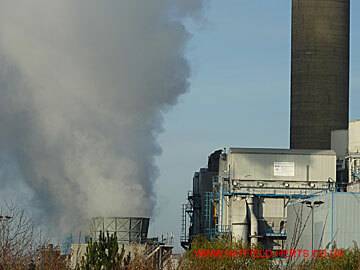 The Edmonton plant is larger than the one proposed for New Barnfield but these pictures give an idea of the size and scale, and the eyesore it would be, if the people of Hatfield and Welham Green – the worst affected (although it would also be visible from St Albans and Welwyn Garden City) – allow it to go ahead. 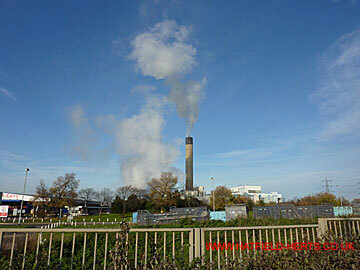 The incinerator stack and its emissions – seen here from the Tesco car park at Glover Drive – dominates the skyline in the area (it is even visible from trains going to London on the Hatfield line and from the carpark at Tottenham Hale station). 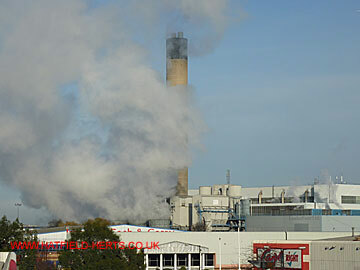 Close up view of the top of the main chimney, itself partly obscured by the emissions of the five turbine chimneys close to its base. 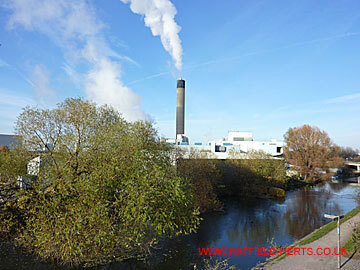 Another view of the facility from the pedestrian bridge across the North Circular. The tops of some of the turbine chimneys can be seen near the base of the main stack. 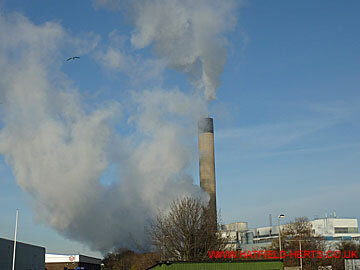 Another view of the incinerator with Eley Road in the foreground. 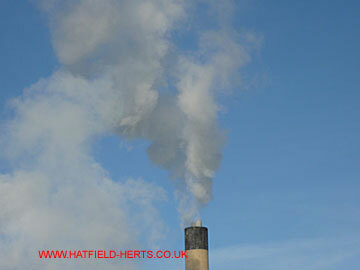 The main chimney is almost invisible through the emissions from the shorter stacks. 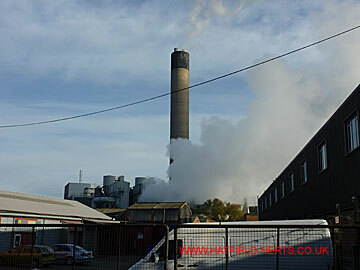 In this view from down Eley Road (possibly on Kynock Road) the facility is almost totally obscured by the smoke and steam. Walking around the facility it is possible to see the separate emission streams from the main chimney and the turbine stacks. Seen here across a neighbouring business's vehicle park (thought to be from Nobel Road). Please note: there are some cloud formations above. 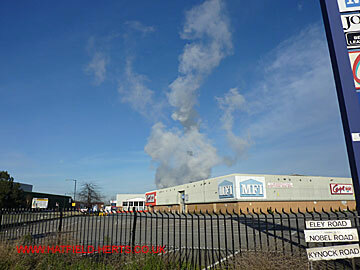 Another view from neighbouring businesses. 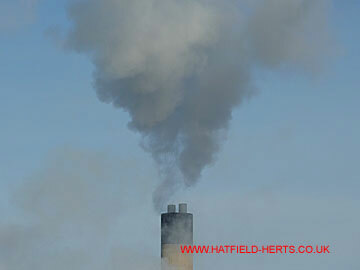 Unfortunately, the smell, which was noticeable from a distance, was horrendous closer to the plant. The view from across a neighbouring fence. 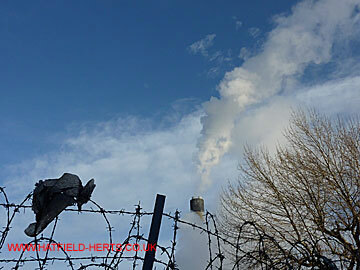 A piece of black plastic rubbish bag has become snagged on the barbed wire – debris from the plant blown by the wind or a reminder of the waste society produces? 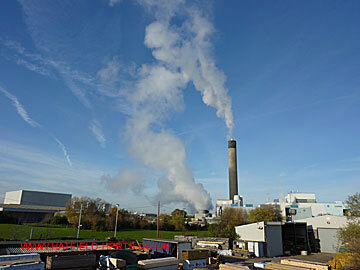 Views from the North Circular / Advent Way. The Carpetright and MFI showrooms visible have closed down. Usually property developers would be falling over themselves to buy the land. Although with that background and smell there won't be many takers in this case. 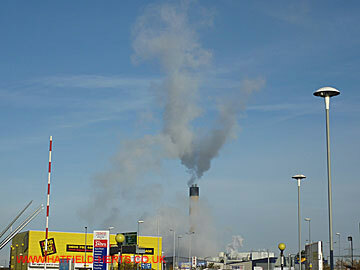 It gives 'wasteland' a whole new meaning: land ruined by waste disposal. 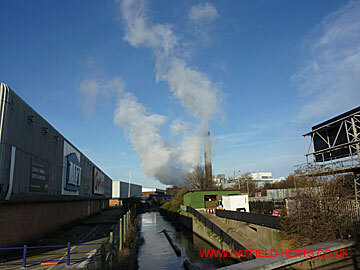 Back of the MFI and Carpetright stores with part of the Lee Navigation waterway visible. Another close up of the top of the main stack. 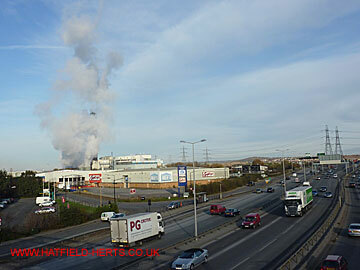 View from Advent Way / North Circular. Skips visible in the foreground beyond the fence. 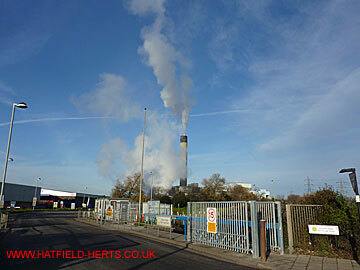 Plumes of emissions stream from the various stacks (although there are some high level aircraft condensation trails). Timber yard in the foreground. 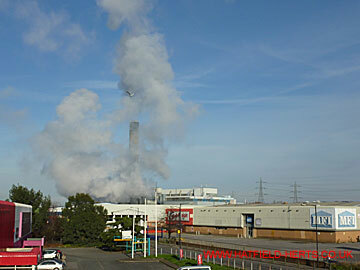 View of the plant with the Lee Navigation in the foreground. 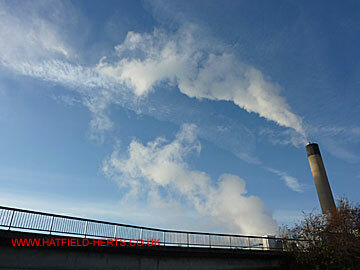 View of the emission plumes from the towpath. 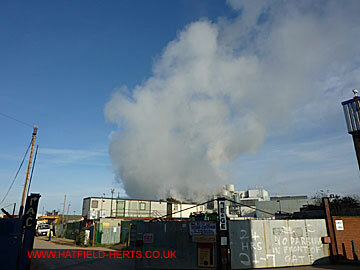 Plant and plumes with the North Circular in the foreground. 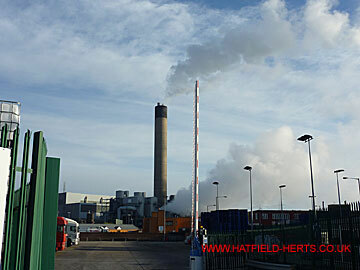 If a similar plant goes ahead in Hatfield people will be looking back in anger.